I posted the image at right on Twitter on 20 February with the caption: “Lean efforts not going so well? Try reversing The Toyota Way #Lean.” It conveys much more information than is readily apparent, which I will explain to help you gain a better understanding of its significance. What we know today as Lean management began with the work of Frederick Winslow Taylor who created Scientific Management beginning in the late 1800s. His work culminated in the publication of book The Principles of Scientific Management in 1911. The United States was a leading industrialized nation, and Taylor’s work was immediately of interest to U.S. industrialists as well as business leaders of other industrialized nations: England, Germany, France, and Russia. The Principles of Scientific Management was translated into many languages, including Japanese. Taylor’s book was also of great interest to business people in nations seeking to become industrial powers, especially Japan. Japanese business leaders observed from afar (through books, papers, conference proceedings, and news stories) the way in which most American industrialists applied Scientific Management, which was to benefit the company at the expense of employees (see REAL LEAN, Volumes Two and Three). They did not like the zero-sum (win-lose) approach to improvement and instead adopted a non-zero-sum (win-win) approach as the basic way of thinking. Both the company and employees would enjoy the benefits of process improvement through mutual prosperity. This basic way of thinking was what Frederick Winslow Taylor had intended. While that did not happen in the United Stated (there were more than a dozen notable exceptions), respecting employees in Japan did not start out as we see it and comprehend it today. It was imperfect and progress towards understanding the relationship between improving process and respecting employees (and later, other stakeholders) was slow. Yet, it evolved over time into what we now see in the few organizations that practice Lean management with distinction. 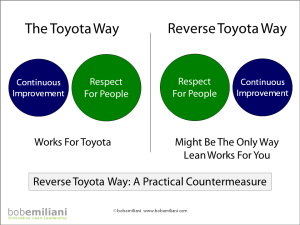 When you look at The Toyota Way in the above image, you see the principles written as “Continuous Improvement” and then “Respect for People” because that is the order in which it appears in The Toyota Way 2001 document. Since the basic way of thinking was to respect employees, the “Continuous Improvement” principle comes first. Of course, both principles must be practiced together because their meanings and evolution over time are co-dependent. For decades, The Toyota Way has worked very well for Toyota (though here have been lapses). But, does the The Toyota Way make sense for non-Toyota organizations with a different basic way of thinking about employees? Since “Lean production” came to our attention in 1988, management’s relationship with employees in the United States has been far more adversarial than cooperative. The basic way of thinking that management has about employees is mostly zero-sum. That is, company, and shareholders, must win at employee’s expense. 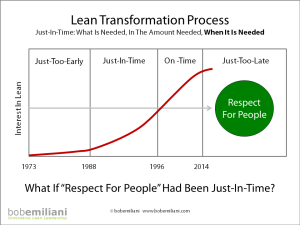 In the Lean timeline, however, “Continuous Improvement” came first for decades, followed much later by “Respect for People.” This is why there has been a proliferation of Fake Lean since the late 1980s. Recognizing this as a major problem, the “Respect for People” principle is now, finally, being heavily promoted. However, it may be Just-Too-Late to correct the serious problems that weigh down the Lean movement. The image at right illustrates the situation as it has evolved over time. Manager’s interest in progressive management practices began soon after he first oil crisis in 1973, but remained low for many years and was understood narrowly as “JIT manufacturing.” Interest increased greatly after the publication of the paper “Triumph of the Lean Production System” by John Krafcik in 1988, the book The Machine That Changed the World by James P. Womack, Daniel T. Jones, and Daniel Roos in 1990, and the book Lean Thinking by Womack and Jones in 1996. However, the “Respect for People” principle was needed at the time Lean (i.e. continuous improvement) was sold to both managers and the public – Just-In-Time or On-Time – not decades later. Top managers became interested in Lean for the narrow purpose of cutting costs and increasing the stock price in an era where they saw their job (incorrectly) as to maximize shareholder value (in the short-term). Their intense focus on continuous improvement left them blind for the need to respect employees and other stakeholders: suppliers, customers, investors, and communities. The result of improvement activities, far more often than not, was employee layoffs. A consequence of disrespectful zero-sum actions such as this a continuation of broad-based resistance to Lean management among employees (especially knowledge workers). Evidence for the “Respect for People” principle existed in the 1970s and earlier, but was ignored or not sufficiently emphasized in subsequent decades until 2014, by which time a great deal of damage was done to the Lean movement in terms of its public perception. Today, when people hear of Lean they think “Lean means layoffs” or “Layoff Every Associate Now.” Legions of managers were advised to pay attention to the “Respect for People” principle, and a few did (1, 2), but the vast majority ignored it. It is possible that the “Respect for People” principle’s arrival Just-In-Time or On-Time might not have made any difference to managers whose increasingly large annual compensation was determined mostly by stock options. As a result of American managers’ basic way of thinking being unfavorable towards employees since the early 1980s (and suppliers and often customers as well – which has now been copied around the world), it seems The Toyota Way must be reversed to improve the chances of Lean management working as intended: as a non-zero-sum principle-based management system focused on creating value for end-use customers and eliminating waste, unevenness, and unreasonableness using the scientific method. The “Respect for People” principle must come first in organizations that have, for so many years, disrespected employees, suppliers, customers, and communities. Inventors too have been disrespected, thought it might not seem that way. So, you have to think: Can investors get better returns if employees, suppliers, customers, and communities are respected? Managers compensated in stock options would have to stretch their thinking because the correct answer is counterintuitive. Reversing The Toyota Way puts the principles in the sequence that they need to be in for organizations whose leaders have low regard for anyone other than themselves. The “Respect for People” principle must be put in place and lived by every day to repair the damage done to organizations (e.g. no employee will lose their job as a result of continuous improvement). 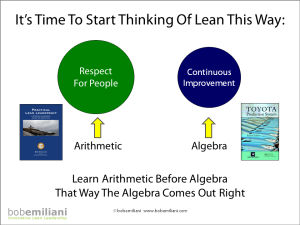 Think of the “Respect for People” principle as arithmetic and the “Continuous Improvement” principle as algebra. One must be proficient, or at least serious about learning, arithmetic before one can move on algebra. If not, the algebra will surely come out wrong. Indeed, we have witnessed poor application of continuous improvement methods and tools (algebra) because managers are not proficient in the basics of human interaction in organizations generally, and specifically when it comes to process improvement (arithmetic). I illustrated this point with the image at right, which was posted on Twitter (18 February) with the caption: “Cambridge, we have a problem. #Lean.” As the putative, if not self-proclaimed, leader of the Lean movement, the Lean Enterprise Institute in Cambridge, Massachusetts (and its sister organization in the U.K. Lean Enterprise Academy) have recognized the problem, yet their response and corrective action, starting in 2007 and slowly building through 2014, is a 90 year old solution that historically has had little impact on leaders: better leadership behaviors. That’s it? 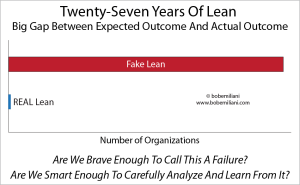 This is the biggest and most serious problem facing Lean management today. Where is the thinking, the new ideas, the creativity, and the innovation? It is not with LEI and LAI. For Lean leadership, you have to look elsewhere. Lean leadership must be understood as more than just leading with respect through the practice of better leadership behaviors. For Lean management to succeed beyond the meager level that it has after 27 years, the “Respect for People” principle must pervade all aspects of business – processes, metrics and policies – as well as leadership beliefs, behaviors, and competencies. Recognizing this will result in better outcomes for all stakeholders, including investors. I agree with your request / proposal / … for Respect of People (and of course develop and challenge). It is clear that we are not using our creativity to fill this in properly. I even hear this comment in Toyota-subsidiaries in Europe. But one remark about your rather sharp objection towards LEI and LAI. Also there seems to be a lack of respect for people. Can we not try to grow to a consensus, slowly by exchanging ideas on a basis of respect? Maybe by searching to come to consensus, we learn something we can share with others in industry? Of course I do not know what history there is between LEI/LAI and youself. I am not trying to judge in this. I only feel unsolved issues between you both, that makes that the bias in the LEI-view (and the weak approach for Respect …) is equal to your bias towards LEI. Or I am wrong? Please help me then to understand. Hi Eric – Thank you for your comments. As a teacher, it is my job to help people understand. So, I am happy to help. Firstly, there is no history with either LEI or LAI. What I wrote is simply the result of my observations. When one is in a leadership position, whether by choice or not, there is a responsibility to serve customers even if it means sacrificing one’s own interests. Non-profit organizations, of course, are chartered to serve not only customers, but the broad community and even the greater good. It is common to find in organizations that have a large share of the market to think they know what is best for their customers. This position precludes exchanges of ideas such. If one’s internal product development efforts are unable to produce an innovative product, then leaders normally look outside of their four walls. An organization that is truly customer-focused will do research to find external suppliers that can provide improved solution(s) that meet their customer’s needs (or which compliment internally-developed solutions). Self-interested organizations ignore the work of others to benefit themselves, thereby compromising their mission. Closed systems do not put customers first. None of this matters if Lean does no harm. But, Lean has done harm to many people, so it matters. As I noted in the blog post, “This is the biggest and most serious problem facing Lean management today.” Customers deserve better than a 90 year old solution that is well known to be largely ineffective. There are better solutions. So, to read between the lines, it seems clear that Bob is frustrated that LEI has not reached out to him as an outside expert, that they’ve ignored his work to benefit themselves. Thank you for your comment. Please read the lines. Reading between the lines has led you astray. Think of it this way: When sick, you expect your trusted physician to give you the best treatment currently available, not give you their preferred in-house treatment which is old and proven to be largely ineffective.